Max. 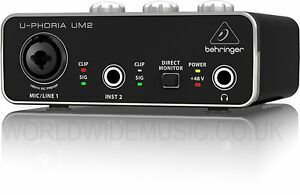 Sampling Rate: 24 Bit (48 kHz) Mic/Line Input: Mic/Preamp TRS 1/4"
Record and produce studio quality tracks at home with the Behringer Um2 U-phoria Audiophile 2x2 USB Audio Interface. Plug this unit into your USB port and you're ready to use it with the DAW of your choice. The unit has two inputs, one of which is a combination XLR microphone with a 1/4 inch TRS jack (guitar cable) and the other is a dedicated 1/4 inch TRS.